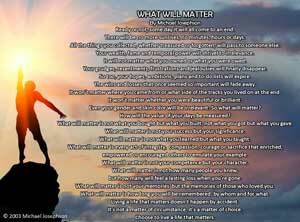 We are so happy that you would like to register for our weekly ‘What Will Matter’ newsletter. If you scroll down and look to the right, the ‘Sign Up’ box will be in the sidebar. Please provide your name and email to confirm your request. Should you decide to unsubscribe at any point, a link will be provided at the bottom of each email we send. Happy Sabbath, I just watched the tape of “the life that matter.” Started with the serenity prayer. be a blessing to others. “Christ living in me, and letting my light shine. I would cherish this forever. Thanks for the inquiry. Wtite vtraweek@jiethics.org and she will help you get a printed copy. For those who make a donation to the Institute’s work a signed copy by Michael Josephson is also available. Would it be possible to buy or make a donation in order to receive the video of What will matter? Greetings and Happy 2016. I am a former educator from New Mexico who was so very fortunate to attend Character Counts! training with you in California. What a difference it makes and still makes in peoples lives. I have retired and now live back in my hometown in Texas, but it does my heart good to go into schools and still see the Pillars of Character listed. A close friend send me the link to What Will Matter and I am happy to open a subscription to it to stay in touch with the things you promote. God bless you and keep doing to good, positive things you do to promote living a positive life and being good citizens. I am trying to subscribe to your weekly news letter and the site is saying I am unable to process my request? I remember you well from your work with the IRS in the 1990s. I was one of the IRS employee instructors who walked our colleagues through the exercises and training. It really was a life-changing moment for me. I discovered that I was not as ethical as I thought I was. When people ask me today if the training made me more ethical, I tell them that it helps me recognize those occasions when I am not being ethical. Then it is up to me to make a choice. Thank you for your continued work. A friend sent me a lovel video from this site. Hence I want to suscribe for it to enjoy more such profound videos. Love your quotes. Please send me newsletter. I am re-subscribing because my email address changed. I enjoy your newsletters! “What will matter”, slides were an excellent reminder to live with purpose and spend our time doing things that will last. Long time listening to the Podcasts. Very much appreciate the opportunity to follow the many pieces have been presented and broadcast over many years. Recently the podcasts have stopped transmitting. When checking the URL, it indicates that their website is no longer functioning. I wonder if it’s possible to check if there is an issue with the site. I do appreciate how busy the task of undertaking the work to. So appreciate that there are many moving parts. I look forward to following your work in the many podcasts in the future. There was an issue with a plugin. I hope everything is fine now. Thank you for letting us know. I remember you from your tutorials in law school. You were wonderful in your ability to teach and to convey perspective. I am so happy to find you once more. I am a long time follower (since your days on the radio). Your messages have been INSTURMENTAL in both my personal and professional life sometimes beyond measure. As I approach retirement to be a “stay at home” Grandmother (which allows my daughter to return to teaching children with disabilities), I look forward to sharing “Character Counts” with my grandsons! Thank you for providing a forum of inspiration! I loved the inspirational quotes and poems and the section on teens! Good comment on grief being painful but not permanent. There’s an unsubscribe link at the bottom of the newsletter emails. Hope this helps. let us know. Thanks! Unsubscribe gets me back to here. Make you unsubscribe plain and make it work. You teach honor now act honorably. You were already unsubscribed when you were redirected to this page. Sorry for the inconvenience. Unsubscribe take me to this page. Please unsubscribe me. When I try to unsubscribe from the newsletter, it leads me to this page. I am a teacher and would like information on how to teach character as part of a social skills class. Signing up for newsletter. Thank you. Thank you for providing this opportunity to “hear” you again Mr. Josephson! Thank you also for your websites and the information they provide, you truly are a National Treasure! I welcome your newsletter. Thank you for distributing kindness to our world. – Added you to the list. Added you to the list. Thanks! I recently discovered some of your work. I’m really impressed and want to learn more through the newsletter. We added you to the newsletter. Thank you for your interest. Hope you’ll enjoy our content. Looking forward to reading the newsletter Thanks in advance for sending this out to me. So looking forward to receiving your newsletter! I was receiving newsletters and for unknown reason they ended. I would please like to receive them again. I thank God to be privileged to know you. I believe that there is a purpose behind this. Please subscribe me with your newsletter. I have been going through this resource and is very resourceful, educating and informative. I can’t wait to part of you! Please add me to your list… I think I did this two other times. I just wasn’t sure if I did it right? My apologies! I am looking forward to your positive emails! referred by a friend. Thank you! Hello. I am looking forward to receiving your newsletter. Kindly add me to the list of recipients of your weekly newsletter. Regards. Of course! Please send us your email. Yes I would like to receive your newsletter, thank you. I subscribed ages ago, got busy, changed my email address… I’m very happy to resubcribe. I’ve missed you. I look forward to reading your newsletter. I would love to subscribe!